Costa Rica accounts for less than 0.05 percent of the world’s surface, yet contains nearly six percent of its biodiversity, making it a must-see for nature lovers. With an expansive coastline, dense forest, and vibrant cities, it’s no wonder that the country has been growing in popularity among tourists, now receiving nearly three million visitors a year. Nearly all international tourists fly into Costa Rica’s capital, San José; however, most swiftly move on to the country’s parks and volcanoes. If you choose to stick around in San José to see its impressive landmarks, start out on its main street, Central Avenue, home to shops, markets, museums, restaurants and more, and don’t miss out on the Central Market to bag a bargain on local goods! Be sure to visit some of the city’s most beautiful buildings, such as Casa Amarilla, the yellow, colonial style-mansion, that is now home to the Ministry of Foreign Affairs, or the elegant National Theater. 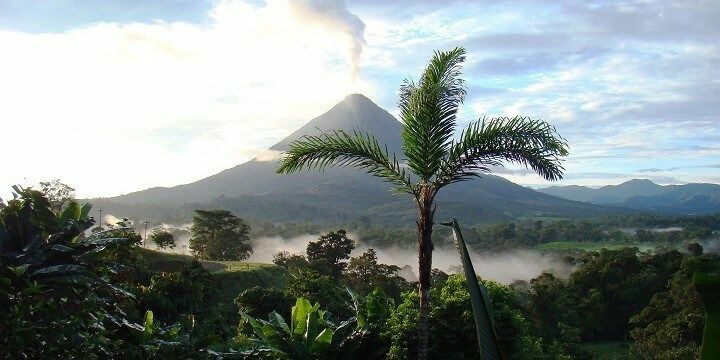 Stretching over 120 square kilometers, Arenal Volcano National Park is home to two volcanoes: Arenal (active, but quiet since 2010) and Cerro Chato (completely dormant). Arenal Volcano National Park is home to two volcanoes. As well as admiring the impressive volcanoes, visitors can explore multiple trekking paths, and spot wildlife, such as toucans and parrots. Although it may be tiring, the 500 steps down to the stunning La Fortuna Waterfalls are worth it for the views of the most-visited falls in Costa Rica. Recover from the tiring hikes by relaxing in some of the park’s peaceful hot springs, such as Tabacón, Baldi, or Eco Termales. Costa Rica’s huge shoreline means you’ll be spoiled for beach choices! If you want to try your hand at surfing, check out Tamarindo Beach, which is great for beginners. After you’ve taken to the waves, head to the town of Tamarindo for a great nightlife scene. Dominical Beach is also popular among water sports enthusiasts, as it’s the only beach in the country with a year-round lifeguard program. If you’re looking to spot some unique wildlife, head to Costa Ballena, where you’ll see humpback whales from August to October and December to April. You’ll also be able to spot nesting sea turtles from May until November. 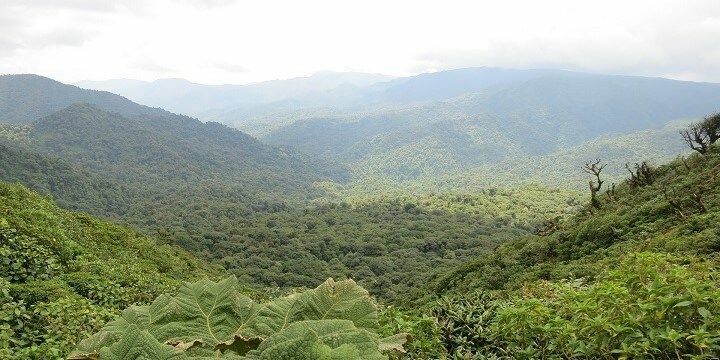 Monteverde Cloud Forest Reserve, established in 1972, is home to half of Costa Rica’s biodiversity, and plays a major role in the country’s booming ecotourism industry. During your visit you could see up to 100 different kinds of mammal, 500 species of bird, and 120 amphibians and reptiles. Monteverde is surrounded by jungle! The main reason most tourists visit the reserve, however, is to walk across the Sky Walk. With six different bridges, located 1,600 meters above sea level, visitors can walk between the treetops, where 90 percent of the forest’s organisms can be found. …it can all be done in Manuel Antonio National Park, the country’s most-popular national park! With both a coastline and dense forest, you’re bound to see a huge range of wildlife during your time in Manuel Antonio. 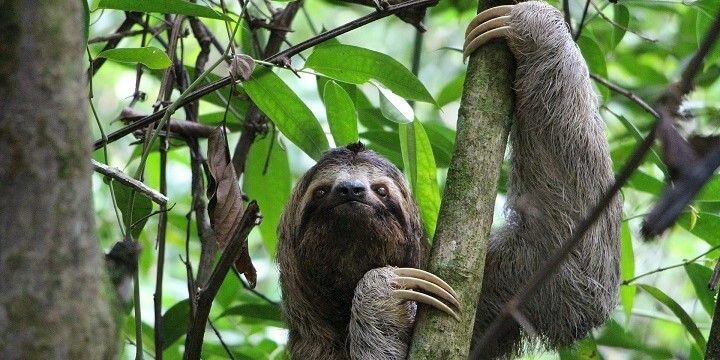 You'll be able to see sloths in Manuel Antonio National Park. Explore the area by trekking along one of its marked hiking trails. 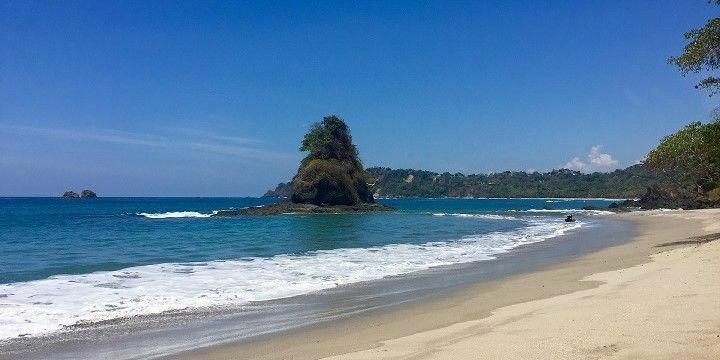 The post popular route is a two-kilometer-long, flat path, which leads down to the park’s main beaches: Espadilla Sur Beach and Manuel Antonio Beach. They both have clean sand and clear waters, making them great spots for watersports, or simply relaxing. Manuel Antonio Beach features clean sand and clear waters. If NextStop24 helped you to choose your next travel destination, we'd be very grateful if you’d search for your accommodation and things to do in Costa Rica through these links. They're affiliate links, which means that we will receive a small commission for every booking made through them. There are no extra costs for you; you'll simply be helping to keep NextStop24 running. Thanks! Costa Rica is great for everyone looking for an outdoor-and-beach-vacation!